Last week, more than 100 new House members arrived to Washington DC amidst a government shutdown that shows no sign of being resolved any time soon. Among the ranks of new House lawmakers are two notable Southern California Democrats: Katie Hill, a 31-year-old nonprofit executive from north LA County; and Katie Porter, a consumer protection advocate and law professor at the University of California, Irvine, in Orange County. Porter is also a single mother of three young kids, ages 12, 10 and 7. Both women ousted incumbent Republicans in the Midterms this past November, and neither has ever held public office before. Press Play producer Michell Eloy followed both Hill and Porter during their first week in Washington as they prepared to transition from representatives-elect to members of Congress. Here’s what their week looked like. 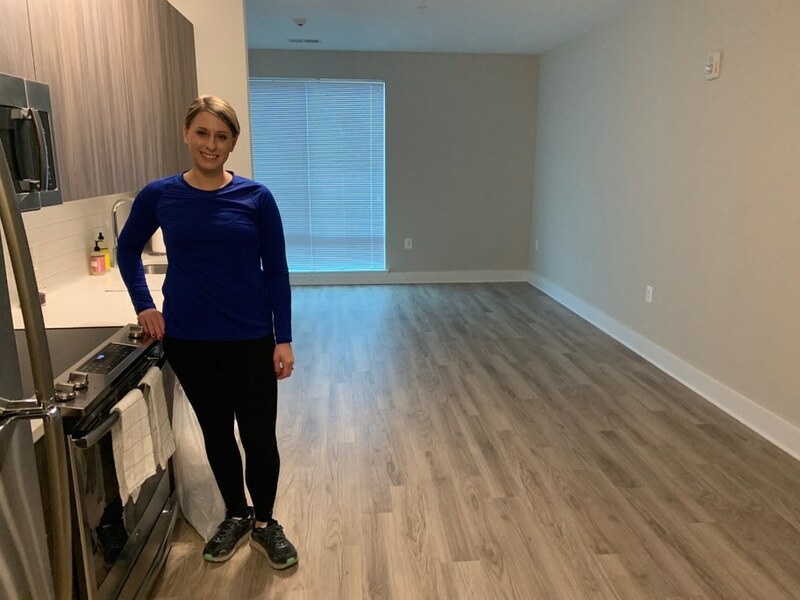 My first stop is Hill’s new D.C. apartment, located just about a mile away from the U.S. Capitol. She’s rooming with Lauren Underwood, another young Democrat from the Chicago suburbs who also flipped a traditionally Republican district. When Hill arrived in D.C. she didn’t have much to show for it in terms of apartment furnishings. She and Underwood went on an IKEA run, but didn’t come away with much. The one piece of furniture Hill had ordered, a mattress from Amazon, was delivered to her home in Agua Dulce, CA. “It’s not like you can just pick up and move all your stuff. I have to keep two households, so it’s literally like creating a whole new one,” says Hill. Hill is starting her job in the middle of a government shutdown, a political stalemate no other batch of incoming batch of lawmakers has ever had to navigate. “It really gives you a sense of the gravity of what you’re coming into and how dysfunctional this has been for so long,” Hill says. It’s move-in day at the Longworth House Office Building, where both Hill and Porter’s new capital offices are located. I stop at Hill’s office first. After giving me a quick tour, she convenes her staff for their first office meeting. “What do you think we need to be successful,” the representative-elect asks her staffers. “I need my log-in info,” one of her new staffers says. The team breaks with a chant to “reopen the government,” though it lacks the enthusiasm Hill wants. But she has bigger concerns. She has to prepare for a speech later today at tea ceremony hosted by the likely next speaker of the House, San Francisco Democrat Nancy Pelosi. After the tea ceremony, Hill has a meeting with some of her fellow incoming freshmen lawmakers to talk about two pieces of legislation House Democrats are pushing to reopen the government. Hill is one of two incoming Democrats elected to represent the freshman class to leadership, so she says it’s her job to get them on the same page. At Porter’s office, just a few doors down from Hill’s, a pizza party is in full swing. Porter is there with her dad, step-mom and three young children, who are in the middle of putting together a bright red LEGO piggy bank. 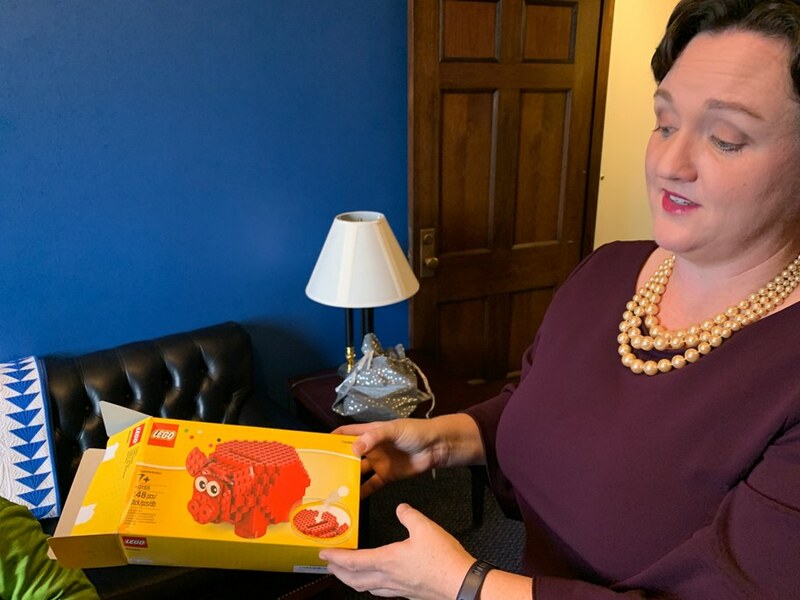 “This piggy bank was a present from on my friends who knows that I want to work on Financial Services,” Porter says, referring to the House committees she’s hoping to sit on. The government shutdown, now in its 12th day, is top of mind for her as well, for both professional and personal reasons: She and her children can’t visit any of the Smithsonian museums. As of this morning, they ran out of government funding. “I think [the shutdown] going to make our first day a little more solemn than it would be otherwise,” she says. Today is the day Hill and Porter have been preparing for since they won their election almost two months ago: the day they’re sworn in as U.S. representatives. By 9:30 a.m., lines of people snake along the steps of the Longworth office building. Despite the shutdown, the mood is celebratory, as friends, family and staffers get ready to watch the 116th Congress be sworn in. Hill arrives at around 9:45 in a black Chevy SUV, wearing a sleek two-piece indigo sheath dress. As she makes her way up the building steps, people shout “congratulations” and other words of encouragement to her. Inside the office, Hill’s mostly female staff starts preparing her for the big day while also juggling all the media outlets that are there to cover it. In addition to me, reporters from CNN, VICE, the Los Angeles Times and the Washington Post are following her. But before Hill can walk over to the Capitol to pick up her member pin, voting card, license plate and parking pass, she has a personal matter to deal with. So while Hill’s staff tends to the various interest group representatives and other visitors who are popping their heads into her new office, Hill makes a call to Amazon. Once the mattress issue is mostly addressed, it’s time for Hill to make her way across the street to get ready to be sworn in. Hill meets her husband, parents and stepparents outside. They’re all beaming with pride. Hill’s mom, Stephanie, hands her a string of pearls that she didn’t even have time to take the price tag off of, and the two hug. 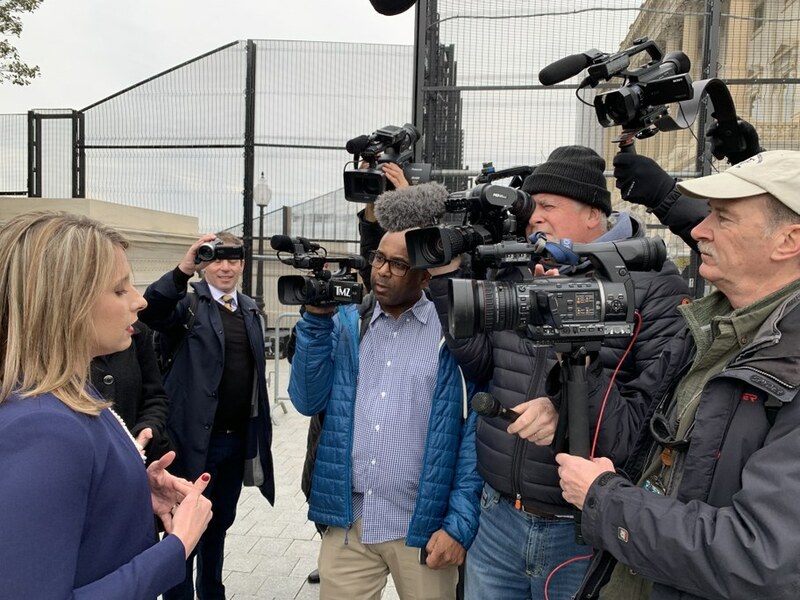 As Hill crosses Independence Avenue, she’s immediately surrounded by cameras and reporters who want to ask her about impeaching President Trump, the shutdown and the wall. “How are you going to come to the middle,” a reporter asks her. After a few questions, Hill, her family and some of her staffers make their way through security. They meander their way through the ornate golden halls of the Capitol building. Hill tries to soak it all in while also trying not to lose sight of her chief of staff. “I don’t even know what we’re doing right now or where we’re going,” Hill laughs. Pin and voting card in hand, Hill heads to the House floor for her first roll call, and to cast her vote for the next speaker of the House. “For the future generations of women who will lead this country, Nancy Pelosi,” Hill says, to thunderous applause from her fellow Democrats. Porter and the five other new members of the California delegation also throw their support behind the San Francisco Democrat. Then it was Hill’s moment, along with the more than 100 other new lawmakers in the U.S. House. “Please raise your right hand,” Speaker Pelosi says before administering the oath of office. After all 435 members of the 116th Congress shout “I do,” the chamber erupts in cheers of celebration. Hill, Porter and the rest of their freshmen class are officially lawmakers. They get little time for celebration. Not long after being sworn in, Hill returns to the House floor to vote on a rules package for the new Congress, which governs how the House operates, and a package of bills to reopen the government. The latter ends up being mostly symbolic, though. President Trump said earlier in the week that he would veto the House Democrats’ plan to reopen the government, and Republican Senate Majority Leader Mitch McConnell said he wouldn’t call a vote on any legislation that doesn’t have the president’s support. After spending yesterday with Hill, I catch up with Rep. Porter. 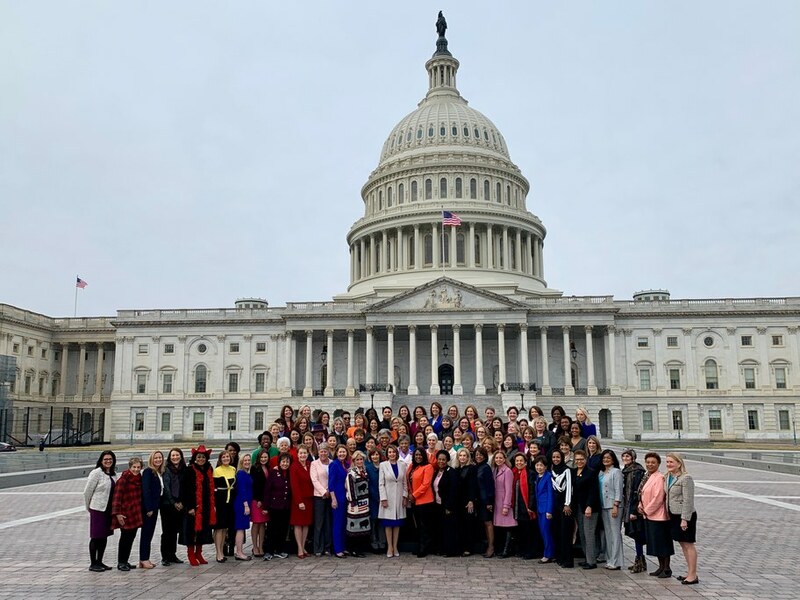 Earlier this morning, she and Hill posed for a picture in front of the Capitol with House Speaker Nancy Pelosi and all of the other female Democratic members of the U.S. House. The mood is still celebratory. 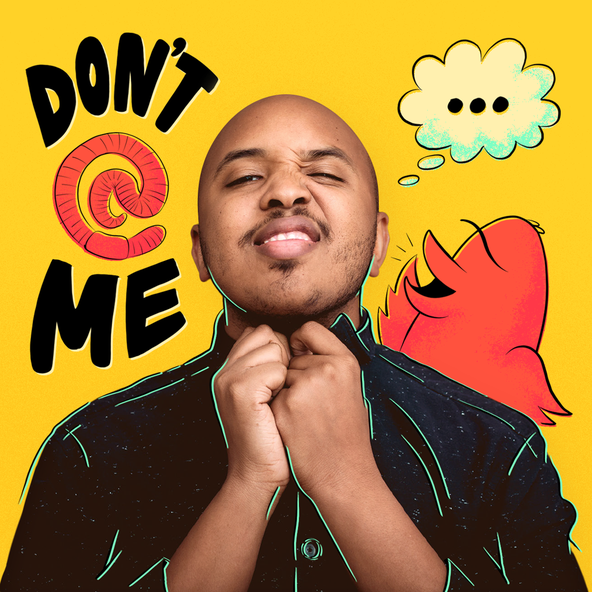 “During the photo a bunch of us were joking that we didn’t have enough space, we were going to overflow the area that they set up for use, we were squeezing people in left, right and center, which is an amazing problem to have,” Porter said. 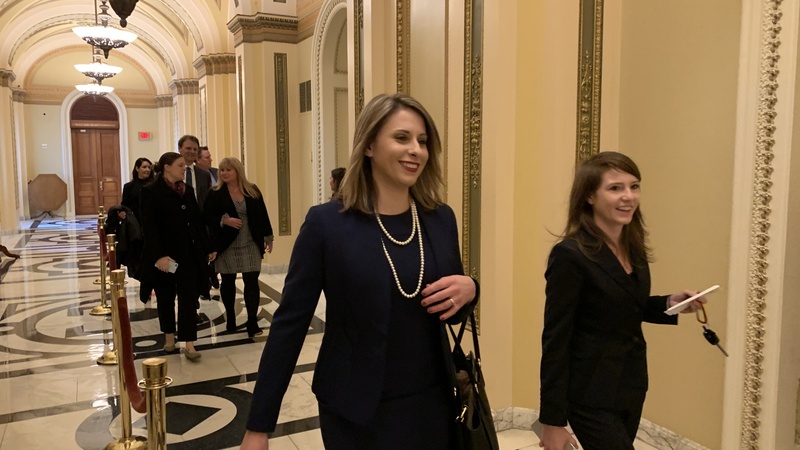 In addition to officially becoming a U.S. lawmaker yesterday, Porter also celebrated her 45th birthday (Coincidentally, she also represents California’s 45th District). She threw a party at a steakhouse just a few blocks away from the Capitol. Porter’s former Harvard law professor, Democratic Sen. Elizabeth Warren, briefly stopped by to offer words of encouragement. But the party was short-lived for Porter, who had to leave early to cast her first votes on the House floor. She says the most exciting part of the day was watching her children stand next to Speaker Pelosi while she took the oath of office. On this day, Porter is trying to squeeze in a few more minutes with her kids before she heads off to Williamsburg, Va., for a retreat with the rest of the freshmen class. She and her classmates will return to a government shutdown that’s well into its second week, after President Trump insisted that he’d keep it shuttered for “months, if not years” in order to secure funding for the wall. Now that they’re lawmakers, Porter, Hill and the rest of the “blue wave” have officially entered a new era of government that’s arguably more divided and more partisan than ever. The highs of winning their elections and moving to D.C. will have to give way to navigating partisan politics, a volatile president, and a government shutdown with no end in sight.